We live in a beautiful, rural area surrounded by nature and wildlife. This means that someones we may see bears roaming in our backyards and the surrounding area. General information about Bear Safety is included below. Keep garbage in airtight containers inside your garage or storage area until you can take it to the landfill. Double bagging and the use of ammonia will reduce odors that attract bears. Do not leave pet food or dishes outdoors at night. Clean up and/or store outdoor grills after use. Use a bear-proof dumpster, can, or store all garbage in a secure storage area without windows until day of pickup. Don’t put meat, fish,melon rinds and other pungent scraps in the compost pile. Keep it aerated and properly turned. Add lime to promote decomposition and reduce odor. Take down, clean and put away bird feeders by April 1. Store the bird feeder until early winter. (Birds will do just fine with the natural foods available.) Bear damage due to bird feeders is a very common and growing complaint. Do not begin feeding birds again, until mid-November when most bears have gone into hibernation. Clean up spilled seed below feeder stations. Bears are very intelligent and complex animals. 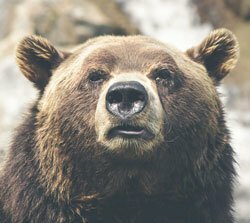 Each bear and each encounter is unique; there is no single strategy that will work in all situations, almost all bear encounters end without injuries, especially if you follow some basic guidelines: Stay Calm. Most bears do not want to attack you; they usually just want to be left alone. Bears may bluff their way out of an encounter by charging and then turning away at the last second. Bears may also react defensively by woofing, growling, snapping their jaws, and laying their ears back. Immediately pick up small children and stay in a group. Talk calmly and firmly. If a bear rears on its hind legs and waves its nose about, it is trying to identify you. Remain still stand your ground and talk calmly so it knows you are a human and not a prey animal. A scream or sudden movement may trigger an attack. Don’t drop your pack. It can provide protection. Back away slowly if the bear is stationary, never run! Bears can run as fast as a racehorse, both uphill and down hill. Attacks are rare. Most are defensive when a bear is surprised and feels threatened or fears for the safety of its cubs; try to avoid such encounters by being alert and making noise. If you have bear spray, use it. If physical contact has occurred or is imminent, PLAY DEAD! Lie on your stomach with legs apart. Protect your face, the back of your head and neck with your arms. Remain still until the bear leaves the area. These attacks seldom last more than a few minutes. While fighting back usually increase the intensity of such an attack, in some cases it has caused the bear to leave. If the attack continues for more than several minutes, consider fighting back. If a Bear ATTACKS YOU IN YOUR TENT or STALKS YOU and THEN ATTACKS: DONT PLAY DEAD-FIGHT BACK! First-try to escape, preferably to a building, car or up a tree. If you can’t escape, or if the bear follows, use bear spray, or shout and try to intimidate the bear with a branch or rock. Do what ever it takes to let the bear know you are not easy prey. Concentrate your blows on the bears face and muzzle. This kind of attack is very rare but can be very serious because it often means the bear is looking for food and preying on you.